Amy and I made the 4 1/2 hour drive down through Fresno and up into the Sierras for a great weekend of four wheeling with folks from the So-Cal XJ List. The trip organizer and trail leader was Richard Gauthier, from Bakersfield. 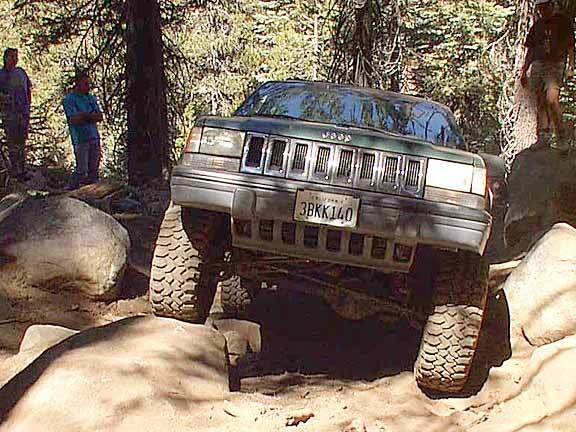 Richard has a truly monstrous Cherokee that is built for heavy abuse, and we got to see it in action all weekend long. Most of the rest of the group was from around Baskersfield, with a few from Ridgecrest and a few from the San Diego area. 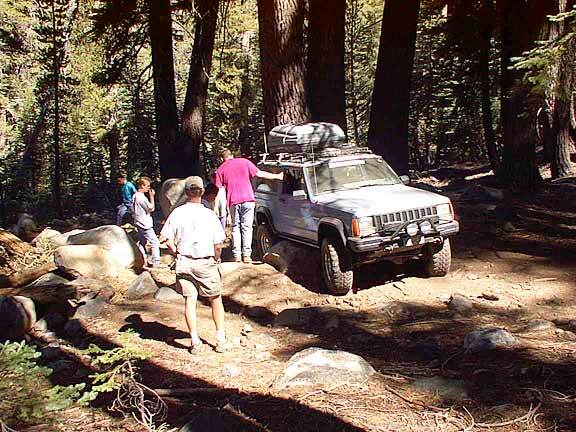 Except for Jim, who trailered Big Red behind a motor home, everybody made the drive in their XJ. 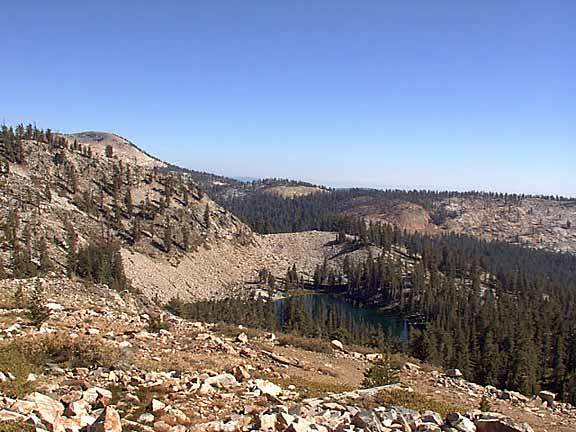 We arrived at the area where we were to camp about 4:30 on Thursday, after boiling over on our way up the 11% grade that goes from Prather to Dinkey Creek. They guy who did my water pump the day before failed to reconnect the aux. electric fan, and it was over 100 outside that afternoon. Curses! Great way to start the trip! I ran into Jim, then Richard and Scott Hilton a bit later. 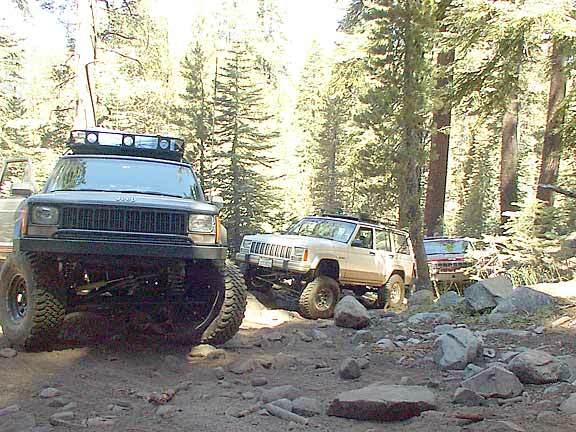 I was getting nervous just looking at Richard's Jeep! Amy and I found a nice swimming hole on our way to check out an old growth stand of giant sequoias up the road from the Dinkey Creek ranger station. Very few people around. By 9:00 there were only five or six people at camp, but more were on their way. We gathered some wood and got a nice fire going, and got to know everybody a little better. By about 10:00, Curtis and his two daughters had arrived, along with Andy and Lisa. 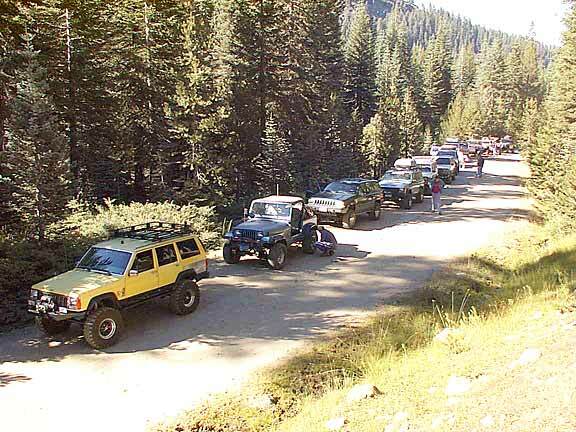 Others who showed up towards bedtime: Paul (from San Diego area) with his blue and white Cherokee, Eric and his son Nicholas, Randy from Bakersfield in his YJ, Bret and friend in a white XJ with a cute puppy named Harley, and a charcoal Cherokee driven by our tailgunner Mil. 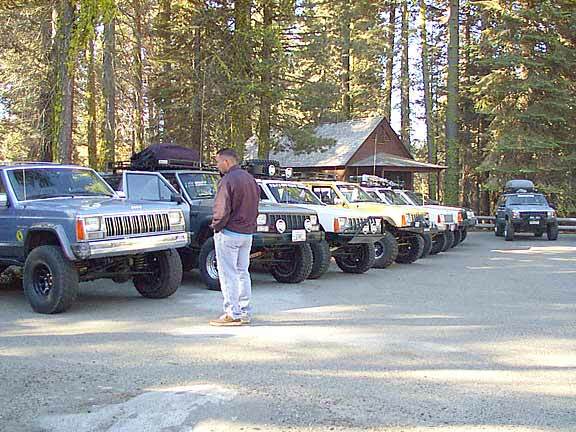 The group turned out to be an impressive collection of 12 or 13 really well-built Cherokees and one YJ. 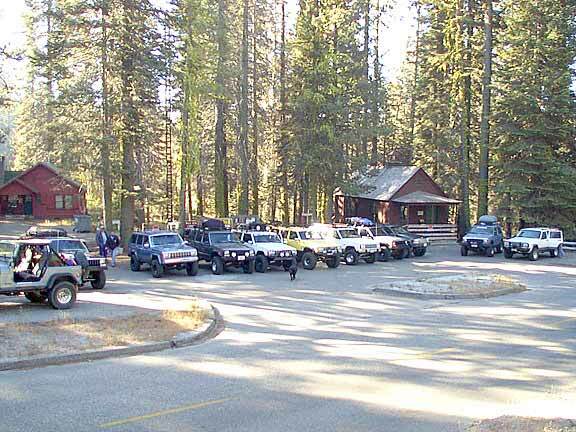 We started out about 9:00 the next morning for the trailhead after getting supplies at the small store near the ranger station. The trail is an 11 mile long loop that starts out at about 5600 feet, goes all the way up a canyon to about 9400 feet, then returns down another canyon to the South. It starts in pine forest and works its way through some very dusty and rocky trail to the summit. Soon after we entered the trail, it got very rocky and rough, and about a mile and a half into it, Eric busted a rear axle trying to climb a fairly innocuous looking boulder. 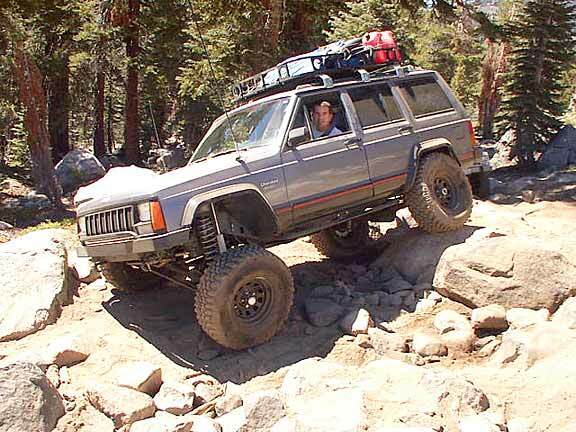 He had a whole bunch of spare parts, including two spare axel shafts, so after he got the Jeep strapped up to a level spot, he jacked it up and went to work removing the busted axel and replacing it. We had lunch and wandered around until the group was ready to roll again. The trail was very tight in spots, requiring some backing and filling and very careful lines to avoid body damage from trees or rocky outcrops. Every now and then we'd run into a little rock garden that would take us a while to navigate. Everybody was great at providing a good spot when needed.